Here are references to talks and posters related to the WISSARD project which have been presented at professional meetings and scientific conferences. Links to the actual abstracts are provided when possible. Christner, B.C., A.M. Achberger, E.L.J.E. Broemsen, K.A. Cameron, M. Dieser , B. Hagedorn, K. Junge, G.M. King, A.B. Michaud, J.A. Mikucki, A.C. Mitchell, M.L. Skidmore, R. Sletten, J.C. Priscu, and T.J. Vick-Majors. Microbial ecosystems beneath polar ice sheets. Invited oral presentation at the 2015 General Meeting for the American Society of Microbiology. New Orleans, Louisiana, 30 May – 2 June 2015. Achberger, A., Skidmore, M., Michaud, A., Vick-Majors, T., Priscu, J.C., Christner, B. (2015) Microbial Community Ecology of Subglacial Lake Whillans, Antarctica. American Society for Microbiology 115th General Meeting, New Orleans, LA, May 30- June 02, 2015. Vick-Majors, T.J., Achberger, A., Michaud, A. Skidmore, M., Boyd, E., Dore, J., Gardner, W., Lu, K., Christner, B., Priscu, J.C. (2015) Sources and Sinks of Carbon and Nitrogen in Antarctic Subglacial Aquatic Environments. American Society for Microbiology 115th General Meeting, New Orleans, LA, May 30- June 02, 2015. Tulaczyk, S., Powell, R.D., Priscu, J.C., Christner, B.C., Fisher, A.T., Fricker, H.A., Mikucki, J.A., Rack, F., Scherer, R.P., Schwartz, S.Y., Skidmore, M., Branecky, C. Burnett, J., Neuhaus, S.U., Sampson, D. Siegfried, M., Zook, R. and the WISSARD Science Team (2015) WISSARD at the Grounding Zone of Whillans Ice Stream: Scientific Operations & Initial Observations 22nd WAIS Workshop, Loveland, CO, USA, Sept 16-19, 2015. Michaud A.B., Dore, J.E., Vick-Majors, T.J., Skidmore, M.L., Achberger, A.M., Christner, B.C., Priscu, J.C. and the WISSARD Science Team. (2015) Microbial methane cycling in Subglacial Lake Whillans, West Antarctica. Microenergy 2015. 3rd International Workshop on Microbial Life under Extreme Energy Limitation, Sandbjerg, Denmark, Sept 21-25, 2015. Vick-Majors, T.J., Michaud A.B., Achberger, A.M., Christner, B.C., Skidmore, M.L., Mikucki J., Mitchell, A., Priscu J.C. and the WISSARD Science Team. Limitations on heterotrophic activity in Subglacial Lake Whillans, West Antarctica. Microenergy 2015. 3rd International Workshop on Microbial Life under Extreme Energy Limitation, Sandbjerg, Denmark, Sept 21-25, 2015. Christner, B.C., A.M. Achberger, E.L.J.E. Broemsen, K.A. Cameron, M. Dieser , B. Hagedorn, K. Junge, G.M. King, A.B. Michaud, J.A. Mikucki, A.C. Mitchell, M.L. Skidmore, R. Sletten, J.C. Priscu, and T.J. Vick-Majors. Microbial ecosystems in subglacial aquatic environments. Invited oral presentation at the 10th International Congress on Extremophiles, Saint Petersburg, Russia, 7-11 September 2014. 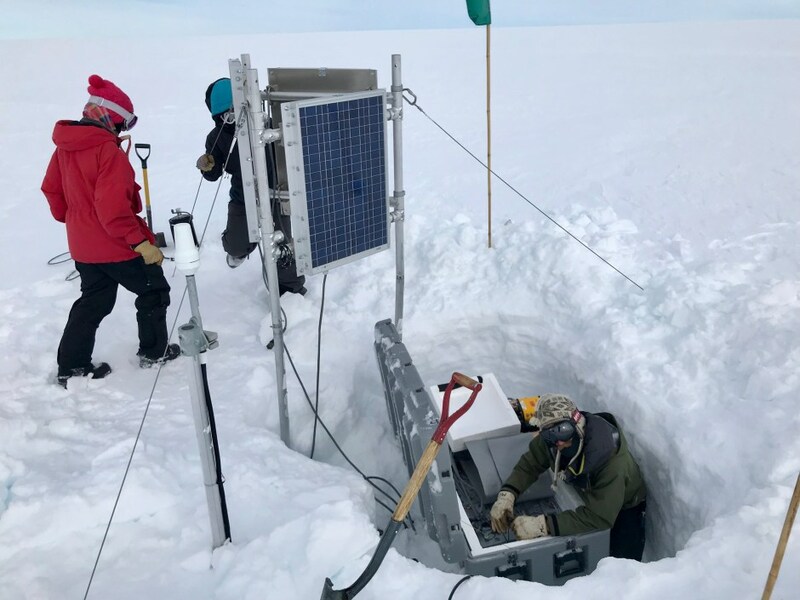 Vick-Majors, T., Priscu J., Achberger, A., Christner, B., Michaud A., Mikucki J., Mitchell, A. Barbante C., Skidmore, M., and the WISSARD Science Team (2014) Microbial nutrient cycling and physiology in Subglacial Lake Whillans, Antarctica, Scientific Committee on Antarctic Research XXXIII Open Science Conference, Auckland, NZ, 25-28 August, 2014. Achberger, A., Barbante C., Mikucki J., Michaud A., Mitchell, A. Priscu J., Skidmore, M., Vick-Majors, T., Christner, B., (2013) Molecular Analysis of Microbial Communities Inhabiting Subglacial Lake Whillans, Antarctica, 5th International Conference on Polar & Alpine Microbiology, Big Sky, MT, Sept 8-12, 2013. Christner, B., Achberger, A., Anandakrishnan, S., Barbante C., Behar, A., Fisher, A., Fricker, H., Jacobel, R., Michaud, A., Mikucki, J., Mitchell, A., Powell, R., Priscu, J., Severinghaus, J., Scherer, R., Skidmore, M., Tulaczyk, S., Vick-Majors, T. (2013) Scientific Exploration of Subglacial Lake Whillans, West Antarctica, 5th International Conference on Polar & Alpine Microbiology, Big Sky, MT, Sept 8-12, 2013. Michaud A., Vick-Majors, T., Priscu J., Skidmore, M., Mitchell, A. (2013) Microbial activity in the sediments of Subglacial Lake Whillans, 5th International Conference on Polar & Alpine Microbiology, Big Sky, MT, Sept 8-12, 2013. Skidmore, M., Mitchell, A., Barbante C., Michaud A., Vick-Majors, T., Priscu J., (2013) Geochemistry of subglacial Lake Whillans, West Antarctica- Implications for microbial activity, 5th International Conference on Polar & Alpine Microbiology, Big Sky, MT, Sept 8-12, 2013. Vick-Majors, T., Michaud A., Priscu J., Skidmore, M., Christner, B., Achberger, A., Adkins, P., Mikucki, J., Mitchell, A., Barbante C., Powell, R., Scherer, R., Hodson, T. (2013) Biogeochemical characteristics of sub-Ross Ice Shelf waters near McMurdo Sound, Antarctica, 5th International Conference on Polar & Alpine Microbiology, Big Sky, MT, Sept 8-12, 2013. Vick-Majors, T., Michaud A., Priscu J., (2013) Physiological Ecology of Bacteria in the water column of Subglacial Lake Whillans, Antarctica, 5th International Conference on Polar & Alpine Microbiology, Big Sky, MT, Sept 8-12, 2013.